Thailand is full of jaw-dropping gorgeous islands, there are over 300 islands in Thailand. How do you know which islands are for you? We’ve put together this ultimate Thailand island hopping guide to help plan your island hopping adventure in Thailand. We reached out to 26 travel bloggers that have done their fair share of Thailand island hopping and asked them for their favorite Thai islands. With so many amazing Thai islands to pick from, we have organized a Thailand island hopping guide so you can easily plan your own island hopping trip. If you only have two weeks in Thailand we wouldn’t suggest picking two or three main islands and island hopping from there. Decide if you want to explore the islands in the Andaman Sea or the Gulf of Thailand. Start your trip off in Thailand’s most popular area the Andaman Sea. You can run this route North-South or South-North. The main island hopping hubs are Phuket, Krabi, Koh Phi Phi, and Koh Lipe. Be aware several of the islands below are accessible during high season November-May. The exact dates when the ferries start and stop changes year to year, double check the dates before planning your Thailand island hopping route. Several of the ferries between islands are closed during monsoon season for rough seas. That doesn’t mean you can’t visit them, you just won’t be able to island hop as easily. If you want to document your trip we highly suggest getting a drone, click here to read our recommendations and tips from a professional drone pilot. Phuket can get a bad rap but this island is big enough that there is something for everyone. There is no need to head to the infamous Patong at all. If you are looking to get away from it all very easily, then consider Mai Khao Beach on Phuket. This beautiful beach is very close to Phuket International Airport but feels a million miles away. At 11 kilometers long, it’s Phuket’s longest and it’s also one of the least visited. This is because it’s part of Sirinat National Park. There are a couple of spots that see more people thanks to a couple of resorts, but the majority of the beach is blissfully deserted. There are no touts, massage places or drink sellers making this not a good choice if you like lots of options, but it’s perfect if you love long walks on the beach or enjoying Thailand’s natural wonders in peace and quiet. Phuket is a great place to start or end a Thailand island hopping trip. Phuket is easily accessible as it has an international airport, with several direct flights a day from Bangkok and other Thailand destinations. There are tons of things to do Phuket. Okay, so the Similan Islands are a slightly different ball game to the other island in the list – mainly due to the fact you can’t really just rock up and stay there! For those of you who are keen scuba divers (or looking to get your open water course in Thailand), the Similan Islands offer some of the best diving in the country and indeed South East Asia. Situated off the coast and reachable by dive boats from Phuket or more commonly Khao Lak this island chain boasts amazing beaches and a huge variety of dive sites. From world famous spots like Richelieu Rock and Elephant Head Rock are packed full of incredible marine life – from macro through to big schools of barracuda, manta rays, and even whale sharks! Whether you love sprawling reefs, big swim throughs or peering out into the blue it’s got something for everything. If you’re looking to scuba dive in Thailand it’s certainly the spot I’d put on the top of your bucket list – and an overnight liveaboard is the best way to check it out. Getting to the Similan islands will involve a minibus and then a ferry. Most tourists visit on a Similan Islands day trip from Phuket. Divers prefer to do liveaboard trips out to the Similan Islands so they can spend several days exploring the underwater world. We loved it here as we had the opportunity to discover some deserted beaches and do a lot of relaxing. Going for a walk we passed the odd motorbike and the 10 baht bus! Yep, you can buy anything from souvenirs to washing-up liquid from the 10 baht bus that circles the island! The island’s population (all 8,000 of them!) are predominately Muslim so the Massaman curries here are incredible and I can highly recommend them. The ferry from Krabi to Koh Yao Yai takes 40 minutes by speedboat. The speedboat from Phuket is only 30 minutes click here for schedule and tickets. It’s a perfect Thai Island to literally do nothing for a few days or more! Koh Hong is a small island in the Andaman Sea off the coast of Krabi, and it’s one of the areas best kept open secrets. Smaller and less popular than bigger islands like Koh Phi Phi and Koh Lanta, Koh Hong is an hour’s longtail boat ride away from Ao Nang Beach but quiet as can be most of the day. The trick is to take a private longtail boat to Hong Island in the morning so you can enjoy it all day; the day trippers on the group tour will come in the late afternoon. This is not as expensive as it sounds — in fact, in our group of 3, it was far cheaper to rent the private boat than it was to take the group tour! Koh Hong has beautiful crystal clear water and calm water, so clear you can see fish swimming alongside you even without snorkel gear. Remember to bring your own lunch and plenty of sunscreen as there are no shops or restaurants on this tiny Koh! Koh Hong is easily reachable from Krabi and Phuket. There are several Koh Hong day trips that include a stop to on the island. The famous Railay Beach just outside of Krabi Town. Thailand can be known for its bucket loads of tourist, but there are still many islands you can go to escape the crowds. Krabi has to be my favorite because it holds two of, – in my opinion – the best beaches in Thailand; Railay and Tonsai. Located on the small peninsula located between Krabi Town and Ao Nang, and only about an hour boat ride from Krabi, these two beaches are about a close to postcard perfection you’ll get. Adventure seekers, pack your climbing shoes as there are tons of outdoor activities to do in Krabi! From rock climbing to cliff jumping, snorkeling and hiking you can fill days exploring these beaches. But then again, you could also grab a mango, get yourself a spot of sand and soak up the peace and quiet! Krabi is easily accessible as it has an international airport, with several direct flights a day from Bangkok and other Thailand destinations. Krabi is a good place to base yourselves for a few days as you island hop around the area. There are tons of Krabi hotel options one for every budget. There are tons of things to do in Krabi island hopping, jungle tours, rock climbing, cooking classes, click here to see more. Tonsai is not technically a “Koh” but it sure does feel like it! When you come in on your rickety long tail boat (the only way to get there), you’ll be greeted with towering rock mountains boasting the most incredible backdrop to the clear water you’re gliding in on. This is a rock climbers paradise, an epic location for base jumpers, wandering flow artists are plentiful, and the views never grow old! I’d come here regularly when I was living in Krabi. There’s nothing quite like a day at the beach at this hippy haven. The vibes here are just like an island, super chill and laid-back. Day trips to nearby (actual) islands are easy and Railay Beach is right there (you should definitely go). Tonsai is a bit secluded and offers just a small selection of accommodation and food although things are changing! Many places, especially budget ones, still run on generators and power isn’t available until the evening. Everything is walkable here and there are no vehicles. Tonsai is one of my top happy places! Coming here for a day might turn into a few days (or weeks) fair warning! Koh Poda is a small paradise island situated at less than a 30-minute boat ride from Ao Nang, Krabi. It’s a quite small island with a diameter of less than 1 km. It basically consists of pristine white sand beaches with crystal clear water to swim around and palm trees, for shade during the hottest hours of the day. Close to shore we can also find nice coral reefs for snorkeling or rent a kayak to explore around. The most spectacular view of the island is probably the huge limestone rock, which seems to balance in the water in front of the beach. This is actually the spot where most tourists come since Koh Poda is one the islands included in the classical 4-island tours organized from Ao Nang. For us, it’s well worth spending more time on the island than a shortstop during the latter excursion. Koh Poda is very close to Krabi and the beautiful beaches are much less crowded than on more popular islands in the area. You can even spend a night here in one of the bungalows in the interior of the island. Koh Poda is easily reachable from Krabi. There are several day trips that include a stop to Koh Pada, some as low as 750 baht. Koh Pu is the Northern half of an island known as Koh Jum. The two halves of the island are so different geographically – mountainous and rocky in the north, and flat and sandy in the south. They actually are referred to as different islands. Only 25 kilometers south of Krabi, you would expect this to be a popular tourist destination, but surprisingly, other than the trickle of tourists that make their way to southern Koh Jum, Koh Pu remains almost entirely off the beaten tourist trail. Not known for its beaches, Koh Pu is more shallow and rocky just offshore. There are very few visitors here, though those who find their way here tend to want to keep it off the radar as it gives the feeling of a deserted island all to yourself. The Internet is not great, as to be expected on a deserted island, so this makes for a perfect place to disconnect, catch up on some reading, and enjoy your time with some fantastic local hosts. There aren’t many places to stay, though Sunset Bungalows (not to be confused with Sunset Bungalows in Koh Jum) are a fantastic refuge. Each bungalow is uniquely designed – ranging from a treehouse to a swinging bungalow suspended by ropes attached to palm trees, and more. The food is delicious, and there is a tiny beach bar there too. If you want to escape, this may be the place to do it. Koh Pu/ Koh Jum is reachable via day trips or ferries from Koh Phi Phi, Krabi, and Koh Lanta. Ferries from Koh Lanta to Koh Jum/Koh Pu is one hour and costs 750 baht. Krabi to Koh Jum/Koh Pu is one hour and costs 650 baht. Koh Jum is one of those off the beaten islands in the Krabi region, but not as frequented as the mainland or string of islands that are typically featured by tourism outfits in Krabi. This makes for a real slice of paradise that is quiet, authentic and filled with gorgeous vistas, beaches and places you will have mostly to yourself. Koh Jum is very laid back with just the right amount of beach bars and restaurants to keep you entertained and feed in your visits. But what you will get instead are long and wild beaches, small villages and eateries, and fewer crowds or even beaches all to yourself depending on the time of year you visit. If your idea of travel to an exotic locale without the massive crowds of Krabi, then head out south to Koh Jum. Just look at that scenery! Koh Phi Phi and the surrounding islands are some of the most dramatic in all of Thailand! Koh Phi Phi is one of the most popular islands in Thailand and for good reason. It’s beautiful curved golden beaches, jagged cliff formations and tangled jungles drew curious travelers at the beginning, and the filming of one of the most popular backpacker films ever, “The Beach” firmly put it on the map as a must-see destination. During the day an iconic photo of the long tail boats in the bay is almost obligatory, and you can catch one out to the uninhabited Koh Phi Phi Leh. At night you can party at the beachfront bars with people from all over the world. Koh Phi Phi might seem overrun for some, but the beauty is still there behind the tourist trade, just waiting for you to find it. There are several day trips to Koh Phi Phi from Phuket, Krabi, and Koh Lanta. There are tons of Koh Phi Phi hotels to stay at, and from there hire on a private longtail or join a group tour. If you are planning on visiting Maya Bay as seen in “The Beach” with Leonardo DiCaprio go early in the morning. Koh Lanta in Southern Thailand captured our hearts from the first moment we got off the ferry. Located in the Andaman Sea, this beautiful patch of paradise is palm-speckled with a whole range of incredible accommodation options available from budget beach shacks right through to luxury resorts. The atmosphere on Koh Lanta is as chilled as you can get, with an interesting mix of Buddhist and Muslim influence accompanying the island vibe. Days are spent lounging in hammocks, exploring the beautiful fishing villages that line the coast, wandering through gorgeous jungles and swimming in the turquoise sea. If you’re into diving some of the best and most accessible dive sites in Thailand are close by as well. 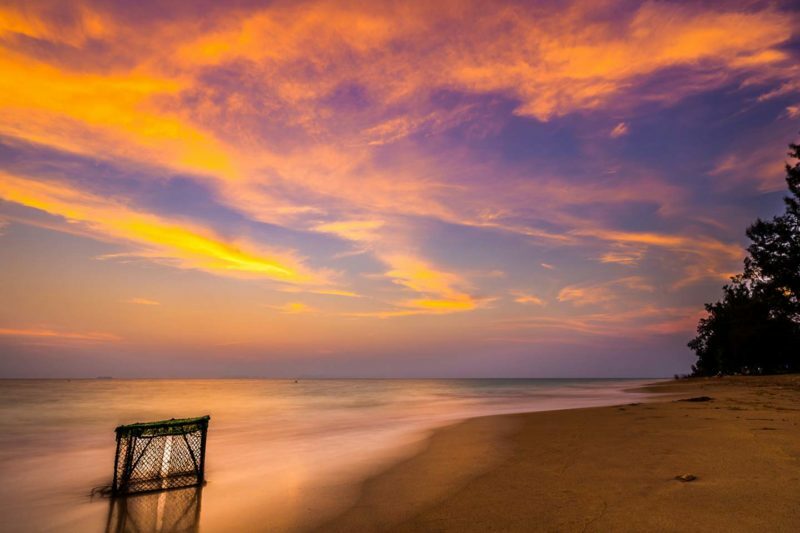 Check out our top things to do in Koh Lanta here. There are tons of island hopping tours from Koh Lanta where you’ll visit several small islands during the day. The nearest airport is in Krabi, shuttles from Krabi to Koh Lanta are available from the airport. When it comes to island hopping in Thailand, one of my absolute favorite memories was the three nights I spent on Koh Mook in the Trang province. While it may not be as popular or well-known destination, it should definitely be added to your Thai bucket list! The one activity that makes people come to Koh Mook is a visit to the mesmerizing Morakot Cave (Emerald Cave). It’s just a short boat ride from the main section of the island, and cannot be missed! I hired a longtail boat for the day and the driver took us to some amazing snorkeling spots, and then off to the Emerald Cave. We jumped out of the boat, swam through this dark enclosed space, and then emerged onto this private beach. It felt so surreal — a place where dreams are made of. While you can visit this place on day trips that depart from Koh Lanta, I’d highly recommended spending a few days on Koh Mook! There are a few amazing restaurants on the beach, beautiful sunsets, and a truly relaxing vibe. If you don’t have time to spend the night on Koh Mook there are day trips from Koh Lanta, click here for tour options some as cheap as 1,000 baht. Koh Kradan is one of our favorite islands in Thailand, mainly because unlike the other overcrowded and touristy laden islands, a visit to Koh Kradan is like stepping back in time. It’s still the laid-back, idyllic beach that everyone hopes for when planning a trip to Thailand. Located off the coast of Trang province, Koh Kradan is the perfect setting for mastering what I like to call the art of doing nothing. So whether it’s long walks on the beach, snorkeling, swimming or just lying down in a hammock as you stare in the infinite shades of blue before you, this island is one of our go-to spots in Thailand. Day trips to Koh Kradan from Koh Lanta are available, click here for options starting at 2,000 baht and include a stop at Koh Mook (above). Koh Lipe is the southernmost island in Thailand and a gem very few tourist have discovered. Gorgeous turquoise waters and white sandy beaches. We ended up on Koh Lipe by accident when we were in Langkawi, Malaysia back in 2014 but have since been back twice. We feel in love with the small island feel, you literally walk everywhere, wake up to gorgeous sunrises on Sunrise Beach, and end the day with 100 baht mojitos watching the sunset on Sunset Beach. Sunrise beach has the softest sand I’ve ever felt in Asia, and you can still rent beach bungalows for under $30 a night. Make sure to check out Stonehenge the best diving in Koh Lipe. During the day rent a private longtail boat to take you to the nearby islands for only 1,500 baht for the entire day, or jump on a group trip for 550 baht. Most tourists don’t come as there is no airport and the island just got an ATM in 2015. It’s worth the trip trust. If I were to do my Thailand honeymoon over again this is where I’d come. Koh Lipe is often called “The Maldives of Thailand” which is a pretty big name to live up to. We’ve spent five weeks island hopping in the Maldives and Koh Lipe lives up to the name. Koh Lipe isn’t the cheapest Thai island but if you follow our Koh Lipe budget guide and it can be done. The nearest airport is Hat Yai, Air Asia sells flight packages which include: flight, shuttle to Pak Bara pier, and ferry to Koh Lipe. Book island trips with your Koh Lipe hotel or tour agency on walking street, most leave at 9 am and are back by 5 pm. Koh Adang is a quick 10-minute boat ride away from Koh Lipe. There is some amazing hiking on the island. Hike up to the Koh Adang viewpoint for the best view of Koh Lipe. This 45-minute hike is steep but well worth it. If you like chasing waterfalls there are two waterfalls on the island deep in the jungle, you’ll basically have the hiking trail to yourself. We only saw two other tourists when hiked to Pirates Waterfall during high season. Hire a long tail driver to drive you around the island and drop you off at one of the many private beaches. You could easily spend an entire day exploring the island or even spend the night camping on the beach. Beach camping is available on Koh Adang for only 200 baht a tent (tent/bedding included) or 30 baht if you have your own tent. There is also a few chalets for 600 baht a night. If you are looking for a peaceful island with just 1 resort, 1 restaurant, and endless beaches this is it. Long tail boats from Sunrise Beach Koh Lipe can be hired to bring you to Koh Adang for 100 baht per person each way. One of my favorite island stops when island hopping around Koh Lipe is Koh Rawi. Koh Rawi is a great place to stop for a few hours have a beach picnic. Program 1-day tour from Koh Lipe stops on Koh Rawi for their lunch break. There is a restaurant on the island with a few dishes and ice cold beers (60 baht) and drinks. I suggest going just after lunch when all the tourist boats are done with their lunch stop so that you can have the island to yourself. There is a great designated snorkeling spot right off the beach. There is no accommodation o the island but a few of the dive shops in Koh Lipe have an overnight dive trip that camps out on the beach here. Koh Lipe group island hoping program 1 stops in Koh Rawi for an hour, as this is where they have the lunch stop. Program 1 costs 550 baht a person OR we suggest hiring a private longtail boat for 1,500 baht for the entire day for a private Thailand island hopping tour around Koh Lipe. Koh Khai is known for its iconic stone arch. It’s also referred to Egg Island, as its name translates to egg island. It got its name from the sea turtles that come to the shores every year and lay eggs. On our ferry to Koh Lipe from Paka Bara, our speedboat made a stop to Koh Khai so we could get off stretch our legs and most importantly take a picture. You cannot spend the night on the island, heck there isn’t any buildings let alone electricity. Some ferries to Koh Lipe from Pak Bara stop at Koh Khai on the way. When booking your ticket to Koh Lipe see if the boat stops at the nearby islands. Our ferry made a 30 minute stop so passengers could get off and get the iconic stone arch picture on Koh Khai. The Gulf of Thailand is big and there aren’t ferries that will bring you from one side to the other. We have two suggested island routes one in the Surat Thani province and the other in the Trat province. Ferries run during monsoon season making this Thailand island hopping available year round. The islands in the Trat province are easily visited if you are coming or going to Cambodia, as they are right on the border. Surat Thani has an international airport with several low-cost carriers we suggest Air Asia. There are also buses to Surat Thani from Phuket (4.5 hours), Krabi (4 hours), and Bangkok (9 hours). Koh Samui was nothing more than an airport and a pier to me for the longest time, just a layover stop on my way to Koh Tao. That all changed when during one trip the travel gods didn’t align and I had to book an overnight stay on Samui. Instead of one night, I decided to stay a few and finally check out what makes this island so popular. While it ain’t no hidden paradise anymore Koh Samui offers everything that makes a Thailand island getaway so good: amazing beaches, yummy restaurants, and bars with a sunset view, and great deals on a big variety of luxury resorts. And unlike more secluded islands, it is easy to reach from various Thai cities and the airport is while small incredibly charming. If you like water activities, Koh Samui is your haven with the Ang Thong National Marine Park right here. If you want more than snorkeling, Samui is also an excellent place to go diving. Peak season is during April and August, but except for November Koh Samui offers great diving at affordable prices all year round. Reason enough for me to extend a layover more often! Koh Samui has an international airport with daily flights from several Thailand cities. If you are on a budget there are several overland options for an example: Bangkok to Koh Samui cost 1,450 baht and takes 10.5 hours (bus and ferry). When looking at flights look at flight prices to Surat Thani, which is located on the mainland. Note there are 2 ferries on Koh Samui so prices and schedules vary. If you plan on island hopping in the Gulf of Thailand the best kicking off point would be Koh Samui. From here you can make your way to all the below islands. There are tons of activities in Samui to keep you busy for well over a week, click here to see more. Ring in the Thai New Year April 13-15th on the island and partake in the fun & crazy Songkran festival. Koh Madsum (or Koh Matsum) is one of the several small islands that are found just a short distance south of Koh Samui which makes it a great escape from the busier life on the larger island. Just a short boat ride away, you can find peace and tranquility, even with a growing number of tourists heading there. We love taking a day on the incredibly beautiful water of the Gulf of Thailand, seeking out the exquisite aquatic life with some snorkeling around the nearby Koh Tan (Koh Taen) and ending at the smaller Koh Madsum for some relaxation on the beach. It is also one of the best places to hire a private snorkeling and picnic tour if you’re looking to find some more secluded areas to enjoy. It’s definitely one of our favorite smaller islands to spend some quiet time together and experience the beauty the islands of Thailand have to offer. Hire a private longtail boat for the day in Koh Samui to bring you to Koh Madsum or jump on a group island trip. Koh Phangan might well be the most famous island in Thailand, thanks to the infamous Full Moon Party that takes place there each month. Up to 30,000 people travel here just before each full moon and there are organized parties all over the island before and after the main event. During the full moon party Haad Rin Beach is covered in thousands of party-goers covered in neon paint but just 24 hours later, after the beach has been cleaned up, it is transformed back into a pristine Thai beach with white sand and glistening waters. Besides partying, there’s a lot more to this slice of paradise than first meets the eye. For rest, relaxation and soothing of the soul, stay in the North end of the island where you will find quiet, pristine beaches, yogis, amazing little vegetarian cafes as well as some of the clearest water this side of Thailand. If you like snorkeling, scuba diving, boat trips or lounging in a hammock with a good book, you will feel at home on Koh Phangan. Be sure to rent a scooter and spend a day exploring all the islands hidden gems – you’ll never want to leave! If you are planning on traveling for the full moon party take note several Koh Phangan hotels have a 3-night minimum. There are several small island trips bookable when on Koh Phangan. Koh Tao was the first Thai Island that I visited and it is the one that definitely stole my heart, making the multi-hour bus plus ferry journey from Bangkok worth the sacrifice (including waiting for one hour at the pier in the middle of the night). Known as the cheapest destination to learn how to scuba dive, Koh Tao has a very chilled vibe and even though there’s a lot of heavy party going on, you can still find your inner state of mind. The marine life you will encounter here is very diverse although for a place whose name means “Turtle Island”, the number of Sea Turtles in Koh Tao has been declining in recent years. Plus, if you love hiking you can always go and explore some epic viewpoints such as the John Suwan Viewpoint from which you can enjoy a panoramic view of the island including some of its many beaches. Also, did I mention that Koh Phangan of the infamous Full Moon Party is just mere minutes away by ferry? If you’ve never dived before there is no better place to try it out than in Koh Tao. Explore the underwater world on a discovery dive, where you get an introduction to diving with a dive master. If you happen to love it getting dive certified in Koh Tao is one of the best and cheapest places in the world. If you make it to Koh Tao, you’d be remiss not to take a (half) day trip to the nearby Koh Nang Yuan. A quick longtail boat ride from Sairee Beach will deposit you on a pier leading to one of the most beautiful white sandbars imaginable. You can rent a lounge chair with an umbrella on the beach for 150 THB (strangely, you aren’t allowed to lay out your beach towel), and swim or snorkel in the 3 lagoons around the island. If you’re into diving, Japanese Gardens is a fantastic shore dive right off the beach. There’s a dive shop on the island where you can rent gear and sign up for fun dives. Be sure to hike up to the viewpoint overlooking the beach: it’s a complete stunner! And for maximum enjoyment, try to get to Koh Nang Yuan early to avoid the snorkel tour crowds that hit the island around 9:30. Hire a private longtail boat for the day in Koh Tao to bring you to Koh Nang Yuan or jump on a group island trip. Trat has a small airport that is privately owned by Bangkok Airways and is located 20 minutes from the pier. The easiest way to get to Trat is by bus, the are buses to Trat from Bangkok is only 5 hours and costs 350 baht. Known as Elephant Island, Koh Chang is Thailand’s second largest island. Located only 300 km from Bangkok near the Cambodian border, Koh Chang is known to house some of the best beaches in Thailand like Lonely beach and White Sand beach. However, beaches and watersports aren’t the only draws for this island as 70% of Koh Chang is covered in rainforest and mountains. Its dense and lush jungle makes it a great island for adventure seekers and nature lovers like ourselves to go jungle trekking or waterfall chasing when we get tired of being beach bums. But what we love most about Koh Chang isn’t the beaches, backpacker vibes, or the popularity, but the ability to escape the touristy areas, and enjoy slower paced, nature-rich, and the less developed countryside without the crowd and hoards of backpackers. If that is something you look for while traveling, you should definitely visit Koh Chang! There are two ferries to Koh Chang and two ferries in Trat. They are car ferries and take 30-45 minutes and cost 80 baht a person. I thought I had found myself a little piece of heaven on earth in Koh Chang, but little did I know that paradise was actually a 20 minutes boat ride away, in Koh Wai. One of the smallest islands of Thailand, Koh Wai is hardly a major tourist hot spot. There’s no sight of flashy lights, elegant (and less elegant) restaurants (just a couple of small, modest but good restaurants), rooftop bars, beach clubs, and spas. There’s no cars, or the ever-present scooters that zip around in all of the other islands: the only way to go around the island is via a footpath through the forest, that connects the two beaches and the various huts that are spread around. Come to think of it, there’s no electricity other than a few generators, and there’s no internet either. Koh Wai is a place to relax, rest, and relax some more. Other activities to be entertained in Koh Wai are: sunbathing; sleeping under a palm tree; kayaking around the island; and snorkeling in the incredibly clear waters that are packed with marine life. Ferries from Koh Chang (Kai Bae pier) to Koh Wai costs 400 baht and takes 45 minutes. You can also hire longtail boats to bring you to Koh Wai. Located in the Gulf of Thailand, Koh Mak is one of Thailand’s smallest and most underrated islands to visit! This is one of the last remaining islands in Thailand that hasn’t been spoiled by too many crowds, even during its peak season. If you’re looking for tons of nightlife, this probably isn’t the island for you, Koh Mak is more of a relaxing and quiet place. Although, there is an annual 12-day rave that happens on the island if you are looking for a party at this paradise. The island itself takes up only 16 square km making it easy to access most of the island by foot. You can find a range of accommodation for any budget from posh villas to cozy budget bungalows right on the beach. One of the more quirky activities on the island includes a love temple that consists of x-rated statues and water fountains tucked away in almost a hidden cluster of palm trees. This attraction is not for the faint of heart, be aware that the man who operates the love temple likes to turn on the fountains on unsuspecting visitors where you will get a “wet surprise” from one of the suggestive female statues. If you’re looking for the perfect palm tree-lined dream beach to relax on, then you’ve found it at Koh Mak. Ferries from Trat-Laem Ngob pier to Koh Mok costs 45o baht and takes 45 minutes. Koh Chang to Koh Mak costs 600 baht and takes 1 hour. A tropical island paradise with stretches of fine white sand, turquoise blue waters, and picturesque palm trees. Koh Kood is one of Thailand’s best islands. Located off the eastern coast of Thailand, close to the Cambodian border, Koh Kood is Thailand’s fourth largest island but with a population of merely 2000 people. Yes, it’s (still) quieter than most Thai islands. If you’re out to party, this may not be the place to go. If you’re looking to relax and enjoy some solitude, definitely consider a visit to Koh Kood. Koh Kood boasts several pristine beaches along its western coast. On top of our list is the beach in Bang Bao Bay, a crescent-shaped bay lined with wooden piers and shaded by palm trees. Another great beach to explore on Koh Kood is the centrally located Khlong Chao Beach. It is one of the longest stretches of beach on Koh Kood and remains the most popular. It’s the closest beach to most budget accommodation and the best spot for watching the sunset. Ferries from Koh Mak to Koh Kood costs 400 baht and takes 1 hour. Ferries from Koh Chang (Kai Bae pier) to Koh Kood costs 900 baht and takes 1.5 hours. Ferries from Trat-Laem Ngob pier to Koh Kood costs 60o baht and takes 1-1.5 hours. Ko Phayam is an island in the Andaman Sea, close to Myanmar. The most distinguishing feature is there are no cars on the island. The island has concrete paths which are big enough for motorbikes, so it’s not in danger of being over-developed anytime soon. There are no ATM’s, the power supply is intermittent, and the internet is patchy. This is not everyone’s dream getaway island. If you want to get away from the big tourist crowds with some nice beaches and an interesting hippy scene, then this is the ko for you. I liken Phayam as “like Pai, with a beach.” There is an alternative scene on the island, but it is nothing on the scale of, say, Ubud. It’s very relaxed, with rustic organic cafes sitting beside cashew trees (of which there is an abundance of). Phayam has a mix of mid-range hotels along with budget bamboo shacks. There is a ferry from Ranong, and from the ferry pier, there are motorbike taxis ready to take you around the island. Traveling to Koh Phayam from Phuket will involve a 5.5-hour bus and then a 45-minute ferry from Ranong. I’m talking about the island of Koh Chang in the Ranong Province, which is located in the Andaman sea along the Myanmar border, which should not be mistaken for the better-known Koh Chang in the Gulf of Thailand. Tourism has not yet become the defining characteristic of Koh Chang, which makes it a rarity among the beautiful and popular islands of Thailand — especially those in the Andaman Sea like Phuket and Koh Phayam. A handful of resorts dot the white and black sand beaches on the sunset-facing west coast. The atmosphere of the island is quiet, rural, and tranquil. Koh Chang is very affordable. Food and accommodations tend to be cheaper than on neighboring Koh Phayam. Wifi on Koh Chang is slow* and the power is usually only on for a few hours per day. So, if you want to unplug, slow down, and unwind, this is the place to do it. Koh Chang is only accessible by boat, long tail taxi boats run from Ranong daily. Tickets roughly cost 200 baht. Protip: Pop a prepaid AIS sim card in your phone and buy a data package. This is the fastest Internet in the islands, though coverage is variable. The next destinations is a very popular weekend getaway for local Thais and expats. It easily accessible from Bangkok. If you’re looking for an easily accessible beach destination from Bangkok this is it. For those travelers looking for a quick easy visa run from Thailand to Ranong is a popular and easy option. Koh Samet was quite a delightful surprise to me on my Thailand trip a few years ago. A three-hour day trip from Bangkok, it offers a great contrast to the hustle and bustle of Bangkok. White sands and turquoise waters are a given on most Thai islands, but Koh Samet has a super relaxed holiday vibe that stays with you long after you’ve left the island. Roughly 200 km southeast of Bangkok, it’s a 3-hour congested drive (and a 20-minute ferry from Ban Phe) you will be glad you made once you reach here. Koh Samet is part of the Khao Laem Ya, the Koh Samet National Park, so don’t be surprised if you run into some exotic wildlife here. Of its 14 beaches, the longest and most well-known is Sai Kaew. It can get fairly crowded here, so you may want to head to some of the quieter beaches to enjoy the natural charm of the island. Ao Tubtim is one of the quieter beaches on the island. Being a small island, Koh Samet can be explored quite easily on foot or bike. I came across several quirky cafes and shops on my long walks here, sprinkled with lazy cats now and then. Having spent a few days in Bangkok I was hoping for a break from the city, and Koh Samet was just the right antidote. No matter where you choose to go Thailand island hopping you’ll have an amazing time. We hope we added a few new islands to your bucket list. You may end up falling in love with Thailand like we did and getting a forever souvenir a Sak Yant tattoo. If you’re spending two weeks in Thailand plan on spending a week on the islands, 3 days in Bangkok, and a few days in northern Thailand like Chiang Mai or Chiang Rai. Agoda.com if you’re traveling during high season we suggest booking your room in advance. If you are starting or ending your trip to Thailand you’ll more than likely find yourself in Bangkok. Bangkok is our favorite city in the world and one everyone should explore, we recommend 3 days in Bangkok as the right amount of time. Our favorite area of Bangkok to stay in is Sukhumvit but check our where to stay in Bangkok guide to see what’s best for you. Hey, thank you so much for posting all your information on Thailand, it has been my go to guide in planning my Thailand honeymoon. We are flying into Bangkok, staying two nights and then would like to head down to Koh Lipe and Koh Samui and then back up to Chiang Mai. We have 12 days to do this. Is this too much in one trip? Where do you suggest to start and finish the trip? Any advice would be so helpful! Glad to hear our Thailand honeymoon guide is your go-to resource! I would say yes that is too much for one trip. Getting from Koh Lipe to Koh Samui would be a whole day. I would start your trip in Bangkok then go to Chiang Mai and end on the beach in Koh Lipe. You’ll most likely have to fly back to Bangkok for your return flight home. Safe travels to Thailand. We are planning on going to Thailand for our honeymoon in may next year. Hoping to spend 2 weeks exploring Thailand. We are arriving in Bangkok and spend a few nights there as your guide suggested. We are then flying to Hat Yai to get to Koh Lipe. Where would you suggest to go from there? I was thinking Koh Lanta/ Krabi. Hi Kylie, Koh Lanta and Krabi would be good options. Krabi or Phuket would probably the place you would need to head to after your time in the islands to catch a flight back to Bangkok. Koh Phi Phi is also beautiful, but more touristy. Have fun in Thailand and safe travels! I could really use some advice! We are a group of two young couples doing a 2-week trip planned for November to Thailand. We have around 6 days dedicated to island hopping and the other 6 for Bangkok/Ayutthaya/Kanchanaburi (remainder is travel to and from USA). We will probably fly in from Bangkok to Phukett and we want to see the full moon party in Ko PhaNgan, but also want to experience more peaceful/less touristy beach spots. I’ve been recommended the following islands: Koh Lanta, Koh Phi Phi, Koh Chang, Koh Tao, Koh Lipe, and Koh Poda. Could you help narrow this down to a realistic 6-day itinerary? With 6 days I wouldn’t recommend stopping at more than 2 islands, 3 could be possible but you’ll be on a ferry or and shuttle bus more than the islands. We love Koh Lipe and always recommend it. Phi Phi islands are stunning, but busier and more touristy. If you want to do Ko Pha ngan and Koh Lipe I would fly directly to each of them from your other destinations to maximize you time. Depending which is first, fly into Koh Samui and ferry to Koh Pha ngan and the from Samui to Hat Yai to Reach Koh Lipe. – or – if you want less travel I would check out Koh Tao from Koh Pha Ngan. Hi there guys thanks for your comprehensive guide its very helpful. We are looking at possibly going to Koh Lipe for a few nights in Late August can you tell me the best way to travel there from Bangkok. The best way in August is to fly to Hat Yai and then take a shuttle to Pak Bara Pier. This is a common route and should be easy to arrange in advance or when you are there. Enjoy Koh Lipe! Hi I’m looking at travelling from Phuket to Koh Lipe but wanted to stop on an island about halfway the distance for a couple of nights. Is this possible and what island would you recommend? I think the best option would be Koh Lanta or Krabi, I would lean towards Koh Lanta. How many days are you spending in Koh Lipe? Thank you for this thoughtful guide! I am having such a hard time planning my Thailand honeymoon. We want to go for 2 weeks (maybe a few days more) – and definitely to start in Bangkok and visit Chiang Mai. After this, we want to explore the islands and I’m thinking on the Andaman sea side. We are not huge partiers, we love food and want to relax and explore the beauty of the country. So my question is: if you could pick two island locations to base ourselves out of (and then if we can do day trips to other islands from there, that would be great! )…which would they be??? We did a two-week honeymoon to Thailand, I suggest you read our 2 weeks in Thailand article here https://www.gettingstamped.com/two-weeks-in-thailand/ We love Koh Lipe and that is always our go-to island and we think the best island in Thailand. Another option would be Koh Samui as there are other islands nearby. I would avoid Phuket and Phi Phi if I were you. Hope that helps and safe travels to Thailand. Thank you so much for this very considerate guide that helps many such as myself, who are extremely confused trip planners…. My husband and I are finally getting time to travel for our honeymoon and are considering some time from end june to august. Would the rains or ferry be an issue then? Every island has different ferry schedules. We know the most about Koh Lipe. If you are traveling to Koh Lipe during May-October the only ferry service is from Pak Bara because it is the rainy season. The rainy season is different every year. I would make note that not all hotels and restaurants are opening during the rainy season. If it rains it shouldn’t be all day so you still will get to see the beauty of Koh Lipe. What a great guide! I have no idea where to go now. I was going to base myself either in Krabi or Phi Phi and explore the islands around. Also going in May, hope it doesn’t rain too much! Glad we could help. There are so many amazing islands in Thailand it is hard to pick. May is beginning of the rainy season so I wouldn’t worry about it to much. It will rain most likely every day but possibly a quick short afternoon shower, which is a great time to go get a massage or happy hour. Let us know if you have any other Thailand questions. Safe travels. This list is awesome, but also very overwhelming. I’m planning a 21 day trip to Thailand this summer. I would like to spend about a week to a week in a half exploring the islands. Reading this made me want to explore them all, what islands would you recommend for, what seems to be such a short time?! Yes there are tons of islands in Thailand to visit it’s hard to pick. Every island is so different. It really depends on what you want to do, what time of year you are visiting and your budget. This is really great info. We are planning an island hop from Lipe to Krabi for 2 weeks and this has really helped. Glad we could help! Enjoy Koh Lipe and Krabi! Beautiful guide! Helped me alot figuring out how I will be doing my trip into Thailand! Everyone doesnt have the same budget and for exemple, paying 2000 baht for a day trip to Koh Kradan from Koh Lanta sound very expensive to me. I can go hiking,drink and hangout on a beach with new friends and explore for 3 days with 2000 baht! I just kinda felt cheap reading some part of this guide. Hi Sylvio, glad the post helped. As you said everyone’s budget is different, don’t take it the wrong way. Thailand is a great option for all budgets, you can have an amazing time without spending a lot of money. Hope you enjoy your trip, safe travels! As a new traveler hoping to make my way up from Malaysia via Koh Lipe, this guide is perfect for me. I now have information on the ferries I need to take and confidence that I can just show up and figure out the rest (with this as a reference). Thank you so much! If you’re traveling to Koh Lipe Christmas week we highly suggest making hotel reservations, it will be busy. Glad our Koh Lipe guide could help plan your trip. Safe travels. Great Guide! I was just thinking…I like to hop around when I visit new places, so to hop islands sounds GREAT!Are there any links to the places to stay on these islands? I would love to visit about 5 island in a 2 week span. Thailand Island hopping is the best way to see the best Thailand beaches. It is possible to see 5 islands in 2 weeks. Can you send us an email [email protected] of what islands you are thinking and your budget we’ll then send over a few hotel suggestions. We are going to Thailand for our honeymoon in late December/early January. We will have two weeks in Thailand and would like to head south and visit 3 islands after our arrival in Bangkok (looks like Koh Lipe is a must). There are so many amazing places to choose from in Thailand so this island guide is great! What three islands would you choose to stay on if you only had 2 weeks in Thailand and knew you had to start and end in Bangkok? Depending on where we stay we will likely plan some day trips to nearby islands to see more of Thailand’s beauty, but we also want time to relax. Any suggestions? Thanks! Hi David, If I had to pick 3 islands for me personally it would be Koh Lipe, Ko Phi Phi, and Koh Tao. All have other islands close by for day trips and are some of the most beautiful. Koh Phi Phi can be a bit of a party island, but there are quiet areas too. Koh Lipe is laid back and stunning waters. Koh Tao is considered by most to have some of the best diving in Thailand and the island itself is beautiful. Or you could stay on Koh Samui if you are tight on time instead of Koh Tao. There is an airport there and easy access to islands like Koh Pha Ngan and other day trip-able islands. Happy planning, hope that helps a bit! Glad we could help ensure you have an epic time island hopping in Thailand! This guide is amazing! My husband and I are planning our honeymoon and I can’t decide on which islands to check out. They all look so great. I do have a question though – we are planning to go end of May to early June and I know that’s during rainy season in Thailand. Do you recommend we omit the West coast islands all together or should we still take the risks? It would be a huge disappointment if all we get is rain during our honeymoon. Again, thank you for this guide! Glad you found our Thailand island hopping guide!I wouldn’t worry too much about the rain in May or June as that is early on into the season. However, note that now all ferries will be running then so you might not be able to hop to as many islands as you could earlier in the year. This year the rain was terrible in December & Januar (non-rainy season). What Thailand islands do you have your heart set on? Great articles,,Thailand known for tropical beaches, opulent royal palaces, ancient ruins and ornate temples displaying figures of Buddha but I love most about Thailand is Thai food and Bangkok . Yes we love the Thai food and Bangkok too! So many great things in Thailand. OMG mind blown – I’ve been to Thailand quite a few times yet there’s always more islands on the list to try. Stunning photos and what a great piece. Didn’t know that you could go to the Simians on a day trip either – may just have to return to Phuket to do that. Mai Khao is a great destination. Thailand will blow your mind with how gorgeous it is. You’ll have to come back to go on another Thailand island hopping adventure! Hope you get to Thailand soon you’d love it. This is a fantastic list. I hope to visit Thailand in the near future. However, I’m afraid this list does not make choosing an island any easier as the all look breathtakingly gorgeous. I would still have difficulty choosing lol!!! LOL sorry but we had to include some of the best Thailand islands out there and there are tons. No matter where you go it will be amazing. Such a great comprehensive guide! We did Koh Phi Phi and some of the smaller surrounding islands earlier this year, but they’re all beautiful! Thailand has been blessed with some many amazing Thailand islands and beaches. Great to hear you had an epic trip exploring them. You and me both! We should plan a Thailand island hopping adventure together!?!?!? The islands in Thailand are massive so a massive guide with great information was needed! Hopefully you get here soon to visit a few. OMG! There are so many beautiful options and now you have me spoilt for choice. I would happily ditch the touristy ones for the others that are secluded and unexplored. I tried picking a favorite but well…its hard. Koh Hong first appealed and then Koh Tao and then…..the list just went on! still confused! To many gorgeous islands to pick from it’s hard. Pick an area and then go island hopping! WOW, that’s one impressive guide on island hopping in Thailand. I have been to Pattaya and Bangkok but Krabi and Phuket are yet to be seen. With your handy tips, we can now plan for a hopping tour without getting confused! Glad we could help plan your island hopping adventure in Thailand. Let us know if you have any specific island questions. Thailand is amazing and def should be at the top of your bucket list. It is hard picking which Thai island is the best for you, but hoping we helped! Thailand is so exotic and beautiful. The innumerable islands, many of which are remote and secluded are true gems. We hope to visit some of them on our next trip there and you round up of the islands provides some valuable information. Thailand is exotic for sure. Hope you get to visit Thailand soon too. Wow, what a massive guide! 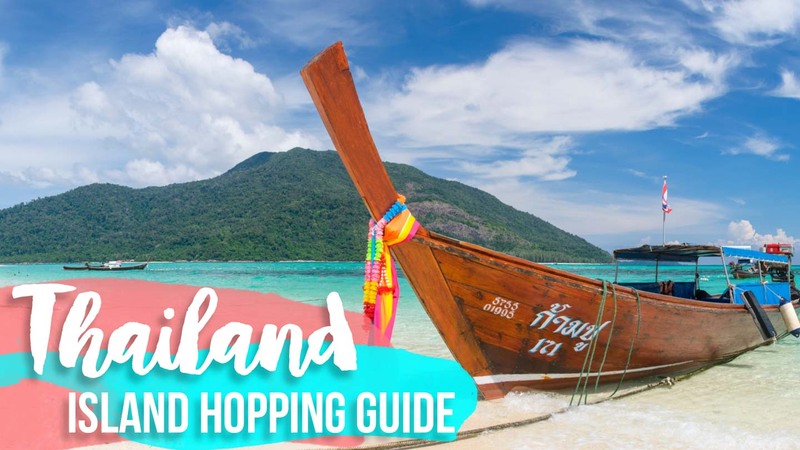 Thanks for putting this together with all of the ferry information too – we’ve always found island hopping in Thailand overwhelming to try and plan because there’s so many options of islands, it’s difficult to know where to start! So it’s super helpful that you’ve listed the hubs and then great day trips from these too. Koh Phi Phi is at the top of my list, it looks so beautiful, unlike anything I’ve ever seen! Thailand can be really overwhelming planning because there are so many epic islands to choose from. Glad we could help you out when planning your own Thailand island hopping adventure. I’ve been to Thailand multiple times but never made it anywhere south of Bangkok or any places along the coast. Oh no! Bangkok is awesome though but on your next trip we hope you make it out to the islands. You know, I knew there were beautiful islands to explore in Thailand but had no idea there were so many or the diversity. I am drawn to Ko Samet, as you mentioned the chance to see wildlife there, which would be thrilling. Love all the practical advice on ferries in order to help everyone get to these places. There is a TON of islands in Thailand and they are all amazing but different in their own special way. So many islands we are yet to explore! Sign me up- snorkeling, turquoise waters and island hopping! Great tips – I wouldn’t have expected private boat rentals would be less than tours. That’s the thing most tourists don’t know that but hopefully we have encouraged them to do their own PRIVATE day trip! Where did you find the private boat rentals? That depends on what island in Thailand you are referring to. We have always had luck just heading down to the beach and negotiating with a long tail driver right there. In Koh Lipe we do this on Sunrise Beach, there is a “taxi” stand for the boat drivers to hang out at.